In March 2010, TDmonthly Magazine interviewed 39 specialty retailers about sales in their bath toy departments. The most popular manufacturer, Alex, came in first place for 26 storeowners in North America. Alex is “king of the bath toys,” said Clyde Walton, owner of The Toy Shoppe of London in Ontario, Canada, listing Shaving in the Tub, Princess in the Tub and Draw in the Tub as his top-selling bath items. Here are the top-10 most-wanted bath toys. Three real instruments for the tub are included in a deluxe gift set. The set includes a xylophone, drum and flutes plus laminated music sheets for every instrument. Also included are mallets for drumming and playing the xylophone. — “Alex Tub Tunes. All varieties in that line sell well,” Mary Porter Green, owner of The Curiosity Zone in Ashburn, Va., told TDmonthly of her best-selling bath play toys in spring 2010. — Seven of 39 storeowners in a March 2010 survey said Alex's Tub Tunes are a top-selling item in their stores. Classic ducks with a collectible twist, these phthalate-free bath floats come in six bright colors. The ducks are sold separately, ready to populate a host of toys for bath, pool or hot tub. — “We do a lot of rubber duckies,” said Wendy Bricht, owner of Chatterpillar Toys, Gifts and Balloons in Frazier Park, Calif., when asked about her best-selling bath toys in a March 2010 survey. — Four of 39 retailers said in spring 2010 that rubber ducks are the best seller in their bath department. With no batteries or complex machinery to worry about, Toysmith's Wind Up Submarine automatically dives and resurfaces. The submarine is 7” in length, and its enclosed gears are designed to ensure a long life in and out of the water. — “One thing we sell consistently is the Wind Up Submarine from Toysmith,” said Mary Sisson, owner of Kazoodles in Vancouver, Wash., of the most asked-for bath toy in her store in spring 2010. — Out of 39 retailers who participated in a March 2010 survey of best selling bath toys, three told TDmonthly Toysmith supplies their top items. Suitable for ages 9 months and up, this automatic spout affixes to the bathtub and draws up an ongoing stream of water that causes a shower when it goes through the tumblers, turns a propeller, and brings a floating friend to the surface. The tumblers can be used alone or stacked for bathtime play. — Three of 39 retailers told TDmonthly in March 2010 that products from the Yookidoo line sell best in the bath category. — 17 percent of retailers surveyed by TDmonthly in Spring 2011 named the Yookidoo Flow "N" Fill as a best-seller in the bath category. Part stacking toy, part water play, Funny Face Bath Beakers offer entertainment in and out of the tub. Each of four nesting beakers offers a different kind of strainer. Whether floating them or pouring water one into the next, children can find lots of ways to play with the colorfully accessorized set of characters. — Out of 39 retailers during a March 2010 TDmonthly survey, two named Funny Face Bath Beakers by International Playthings as a top-selling bath item. Spielstabil Coffee and Tea Service by HABA USA/HABERMAASS CORP. Durable, bright colored and safe for young children, the Coffee and Tea Service from the Spielstabil line offers kids a realistic tea party with a full host of serving ware. 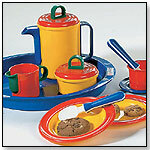 The tray, plates, cups and pitcher are all dishwasher and microwave safe, whether little ones want to have a pretend or real tea party. — Kristen Pollard, owner of Mud Puddle Toys in Marblehead, Mass., told TDmonthly in spring 2010 that Haba's tea sets sell best in her bath department. 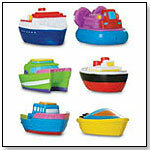 — Two of 39 retailers said in March 2010 that Haba is their best supplier of bath toys. A bright smiling motor boat, cheerful skipper and faithful canine companion are designed to bring fun and interest to bath time. The two characters come out of the boat, which floats in the bath or rolls along on its hidden, friction-powered wheels for out-of-water playtime. — Out of 39 retailers surveyed in March 2010, two named Wow Toys as their best-selling line of bath items. Elegant Baby's Squirtie Bath Sets are designed to be simple and safe. The soft water squirters for bath or pool time are brightly colored, easy for little ones to hold, and free from phthalates. 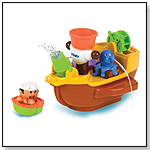 This gift set contains six individual boat-shaped water squirters. — “What we sell time after time is the Bath Squirties from Elegant Baby,” Cheryl Richmond, owner of Punkin Doodles in Havre, Mont., told TDmonthly in March 2010. — “The more water you can squirt, the better,” said June Hargrove, owner of Black Forest Books & Toys in Charlotte, N.C., in spring 2010 of what makes a popular bath toy in her store. •To Litigate or Not to Litigate?